Concentrating on anything for more than a few minutes has proven tough for me lately. I want to be focused, organized and pulled together but these days I’m happy getting out of the door with a pair of matching shoes on my feet and my wallet in my purse. I have been thinking a lot about how the internet and modern life, in general, has changed in the last few years and am staggered at how every aspect of life has been affected. We spend more time on our devices, isolated from engaging with real people, lost in this alternate reality that doesn’t exist. Five years ago if I were bored or wanted to do something, I would get in my car and head to the video store and spend 30 minutes browsing for a movie, then I’d grab some snacks or a bite to eat. Then I could look forward to spending the night curled up on the couch with my husband to watch the movie since we had to return it the next day. Now, all I have to do is open my Amazon app, and I have a world of movies at my fingertips. Why do I ever leave the house at all? I don’t need to go out to shop for things I need, with one click all my needs are met. But are they? I realize that I miss having that active participation in my life. Having a world of books, movies, and YouTube videos, at hand makes it impossible for me ever to be satisfied with one choice. There is always that feeling of missing out, that there must be something better out there, and it’s so easy to keep looking. So I find myself always endlessly looking for something bigger and better, and I’m never satisfied with living in the moment. When I was younger, I spent all my time hanging out in record stores shopping for rare vinyl or browsing bookstores. Both of those experiences are in danger of disappearing. In the modern world, there is no need to have brick and mortar locations where we connect with a product but more importantly with other people. Don’t get me wrong I love those conveniences, but by digitizing all aspects of our lives, it’s becoming difficult for us to find opportunities to connect on a personal level with other people. So I’m trying to find time every day to turn off all my devices, not check e-mail, or Instagram, or Twitter and engage with people in the real world, not a made up one. I’m curious, am I the only one that is feeling this way? How do you make meaningful social connections in the modern world? I’d love to hear your thoughts on the matter. Regardless, enough of that. 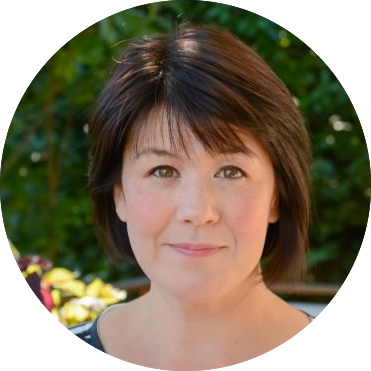 When I am stressed out and feeling restless cooking helps me feel more grounded and in touch with the real world. Baking especially calms me and gives me a sense of purpose and direction. At least for a few short moments I can concentrate and focus on one thing in my life. I realized I’ve never shared a waffle recipe with you all. My son loves Eggo waffles. It took me a long time to find a homemade replacement that would satisfy his need for these frozen processed treats. The key to a great, light and crispy waffle is egg whites. 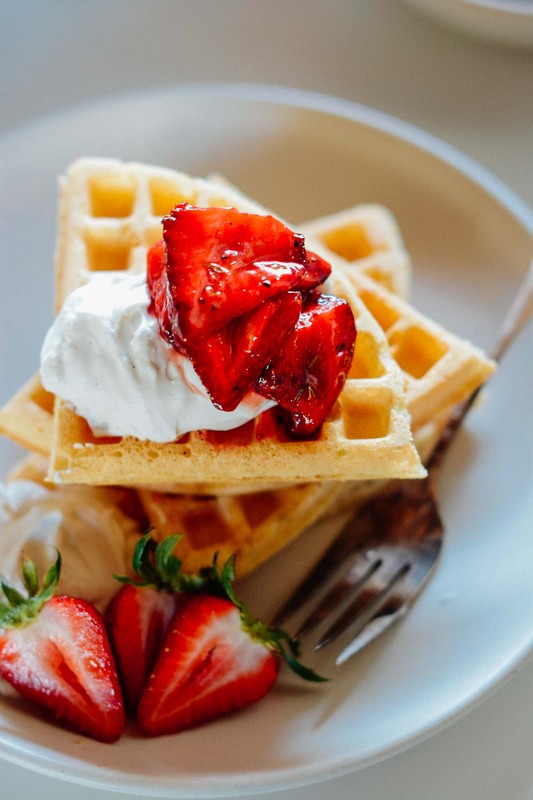 I’ve tried to make them a bit healthier by using whole wheat spelt flour, coconut oil, and natural cane sugar, but I would put them up against an Eggo waffle any day. 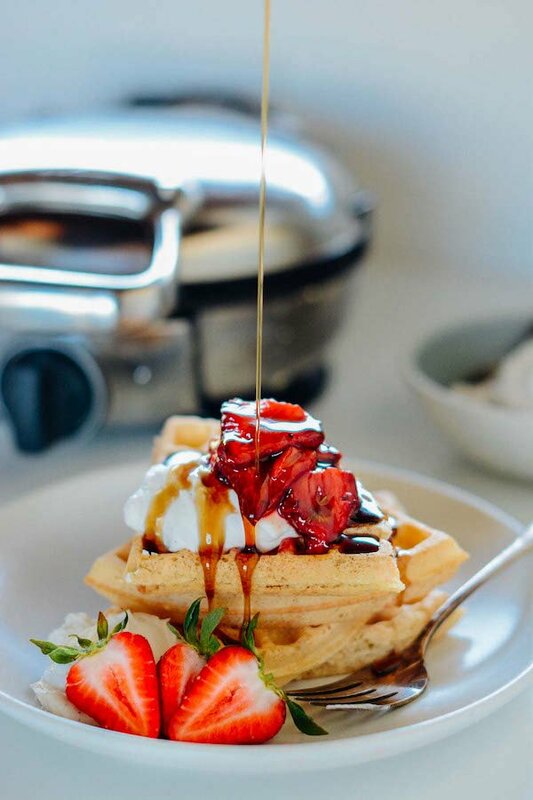 I served these with some easy roasted strawberries and my favorite coconut whipped cream but they are great on their own with just a drizzle of maple syrup as well. I thought I’d try something new and push myself so I created a .gif from some of the photos I took. I know that it’s a bit uneven and I should have shot with a tripod but I had a great time experimenting with the effort. I’ve been considering sharing some of my photography and styling tips with you all. Is that something that would interest you? I’d love to hear what you think of these spelt waffles. If you give this recipe a try, post a comment, or take a pic and tag it #scalingback on Instagram! Whisk together the maple syrup, olive oil, kosher salt, and chopped thyme in a bowl. Add the berries and toss gently to coat. 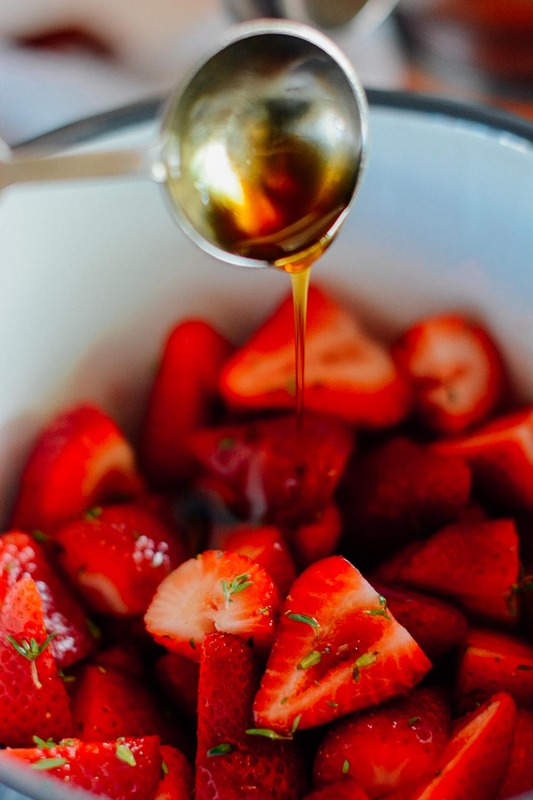 Arrange the strawberries in a single layer on the prepared baking sheet. Roast the berries just long enough for the juices to thicken but not burn, about 20-30 minutes. You may need to gently toss the berries if the edges are starting to brown before the rest of the berries are finished cooking. Combine the almond milk and apple cider vinegar in a measuring cup or small bowl and let sit for 5 minutes while you prepare the rest of the ingredients. Combine the flour, arrowroot powder or cornstarch, sugar, salt, and baking powder in a large bowl. In a separate bowl, whisk together the almond milk, coconut oil, and egg yolks. In a third bowl, using an egg beater or an electric mixer, beat the egg whites into stiff peaks. Heat the waffle maker, and when it is ready, add the wet mixture to the dry ingredients and stir until the mixture just starts to come together. 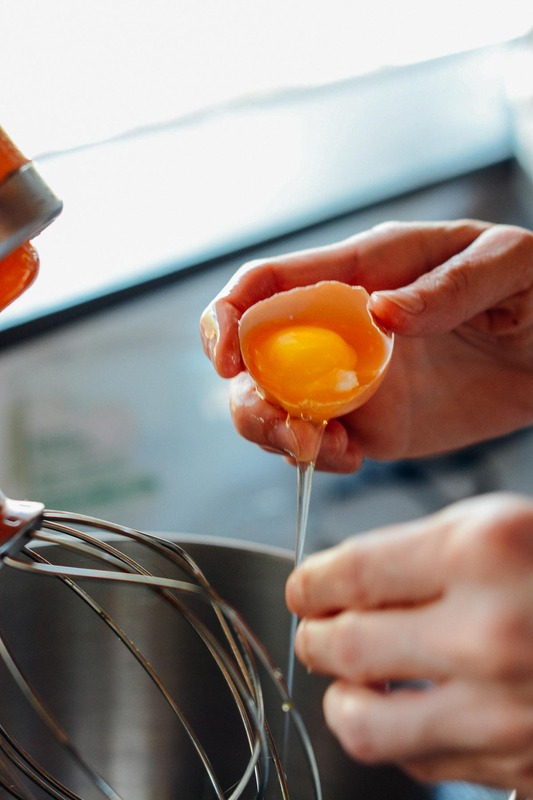 Dollop the egg whites across the top of the batter and fold until uniform, using a few strokes as possible. Use a scoop to ladle the batter into your waffle iron and cook until deeply golden and crisp. If you'd like to keep them warm you can pop them into a pre-heated 225 degree oven while you prepare the rest of the waffles. Any leftover batter will keep for a day or so, refrigerated. The waffles are easily frozen and to reheat just pop them into a toaster oven or oven for about 5 minutes. Remove the coconut milk from the fridge and turn it upside down. Open the can and pour off any of the coconut water that has accumulated. 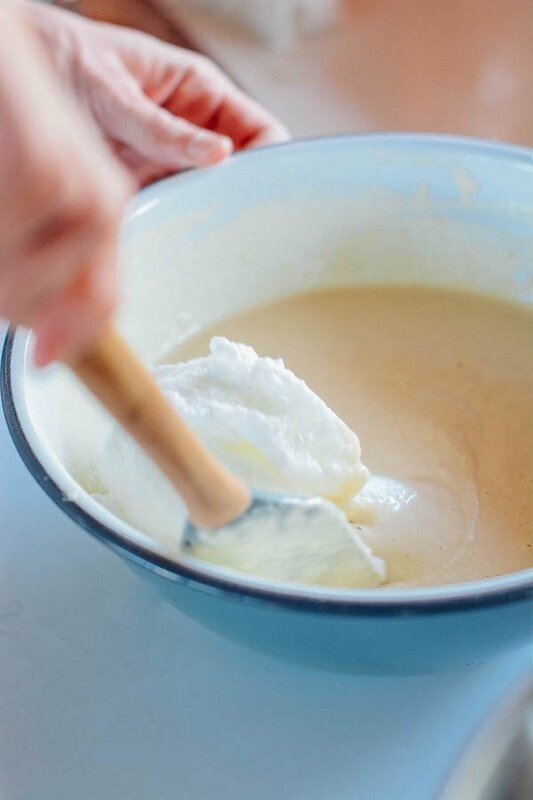 Place the coconut cream in the bowl of a stand mixer fitted with a whisk attachment and add the maple syrup and salt. Whip until light and fluffy, 1-2 minutes.